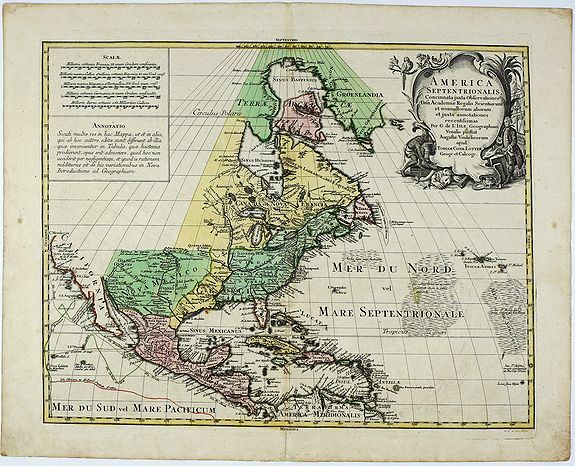 Old map by LOTTER -America Septentrionalis Concinnata juxta Observationes . . . Title: America Septentrionalis Concinnata juxta Observationes . . . Size: 18.9 x 23.0 inches. Condition: In very good condition. Paper with map maker’s watermark. Split in lower centrefold margin repaired, does not reach the image. A very nice map of North America, it shows California as an island, after the foundation map by de L’Isle published in 1700, which was the first map to reconnect California to the mainland. The tracks of a number of explorers routes are shown along the west coast.